I discovered Katie Fforde in my final year at university – when I was stressed, overworked and severely in need of relaxation. At the time I’d been dealing with the stress by watching a lot of DVDs (I had an unlimited LoveFilm membership and boy was I using it) because as a History and French student I was doing a lot of reading for my courses and reading didn’t seem like much of a treat! I was also working on a very limited budget – and I was trying not to buy books. I picked up my first Katie Fforde (Paradise Fields I think) at York Central Library – on a trip to borrow DVDs – and I was hooked. I knew from the start that these would be books that I would re-read over and over and my budget went out the window as I started buying up her back catalogue. As it turns out Paradise Fields is possibly my least favourite of her books now I’ve read the lot – and I think it is the only one that I don’t own – and I did buy myself a copy over the internet but it was the wrong size* and so I got rid of it. There is a bit of a formula to them – and you’re not exactly going to have trouble working out who the heroine is going to end up with (or at least you’re not once you’ve read a few of them) but they’re brilliantly relaxing reading, which will leave you with a smile on your face and a warm and fuzzy feeling inside. If I had to pick a favourite, it would be Stately Pursuits. It has my favourite type of heroine – Hetty’s fairly close to the age I was when I first read the book (nearly a decade ago – crikey!) and I like my male leads to come from the grumpy on the outside but with a soft centre mould. Connor’s dilapidated stately home – which Hetty is sent to house sit adds to the books charm for me – I love books with houses as a character, that’s why Trisha Ashley’s A Winter’s Tale has been my favourite of hers for so long (although I think I like her “new” one Every Woman for Herself nearly as much). Like Hetty, many of Fforde’s heroines have (or get thrown into) interesting jobs – in another of my favourites, Flora in Flora’s Lot inherits a share in a struggling auction house and fights to save it (whilst falling in love), but there’s also wedding planners, artists, cooks on canal boat restaurants and interior designers. Another of my favourite books is Thyme Out – where Perdita, the salad gardener, ends up supplying the restaurant owned by her ex-husband and then working with him rather closer on a TV series. For me Fforde’s books are great examples of the cozy romance genre – they’re not raunchy or rude and they won’t make you blush on the train – they are entertaining and romantic and do exactly what it says on the tin – what more can you ask for?! 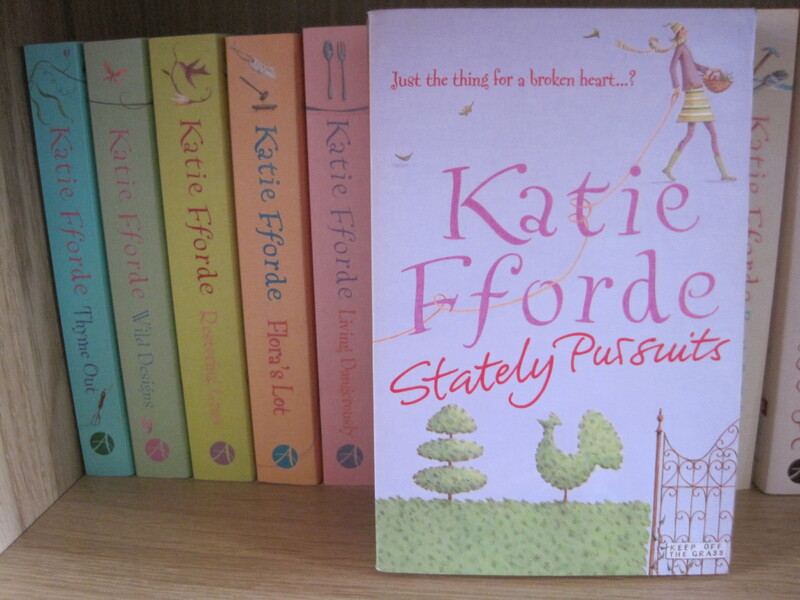 You can find Katie Fforde’s back catalogue in any good bookshop – like Foyles – and her new books are usually stocked by the supermarkets in their multibuy promotions and they sometimes have some of the older ones too. * I’m planning a post about my OCD tendencies when it comes to book jackets and arranging my shelves. But trust me when I say that I really don’t like it when books by the same author aren’t the same size and cover design!